Last fall, I spent a few weeks cooking from Ethan Stowell's New Italian Kitchen. Can you remember back that far? I can't, but I'm updating my cookbook reviews, which I haven't done for almost a year and which has been bugging me for almost a year. Not that anyone cares anymore, but for the internal integrity of the blog, I have to do this. A recap: Ethan Stowell's New Italian Kitchen is a handsome, earth-toned book full of enticing pictures of rustic food as prepared by a famous Seattle chef, the owner of How to Cook a Wolf and Tavolata, among other restaurants. Charlotte Freeman, who writes the Cookbookslut column at Bookslut, hated Stowell's book with a white hot fury. Its cheffy pretensions -- reminders about using only best quality ingredients, the "tone of haughty hyper-reverence" -- made her want to "stick hot needles" in her eyes. I don't disagree with any of Freeman's points, which are all valid criticisms, but this book didn't make me want to stick hot needles in my eyes. (In fact, I can think of nothing that would.) To the contrary, I enjoyed Ethan Stowell's New Italian Kitchen. Probably because I spent very little time reading the headnotes, which are indeed irritating, as I was so completely smitten with the recipes, which I found fascinating and exotic. Opening the book again this morning, I saw at least a dozen unusual, seductive dishes that I'd like to cook in the appropriate season: espresso granita with grappa cream, pear-star anise ice cream, soft-shell crab bruschetta with spring garlic aioli, canneloni with braised pork cheeks and sweet cicely. That is, if I knew where to buy pork cheeks or sweet cicely without making a dozen phone calls and a trip to Berkeley. Which is why, last fall, I cooked only 13 recipes from this book. (By comparison, I made 57 recipes from the Moro cookbook; 36 out of Thomas Keller's Ad Hoc At Home; 52 out of Claudia Rodin's Arabesque.) A lot of Stowell's dishes, maybe even a majority, call for obscure ingredients I could not readily find: ramps, rabbit loin, lobster mushrooms, Thumbelina carrots, Cacio Faenum cheese, snails, live sea urchin, lamb's tongues, nettles. Et cetera. Sometimes I'm up for a scavenger hunt. In October 2010, apparently, I wasn't. 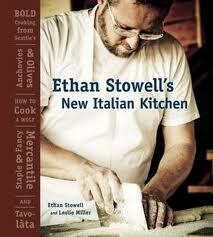 While I don't think it's a shelf essential, Ethan Stowell's New Italian Kitchen still shines for me. I plan to throw away cookbooks that don't review well on the blog, and Mixt Salads is long gone. This book stays. Done! On to Dorie Greenspan.